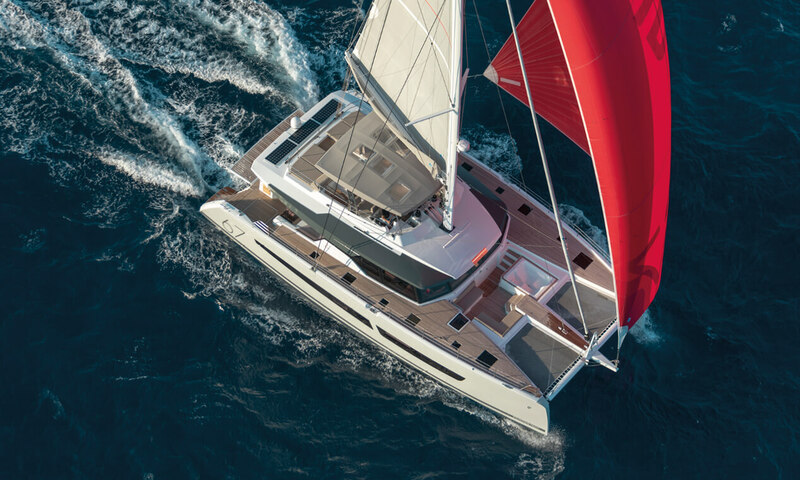 The 22m/72.8ft luxury catamaran BLACK CAT from Fountaine Pajot was built in 2019 with a carbon composite hull and superstructure. The naval architecture comes from Berret-Racoupeau Yacht Design and the modern accommodation sleeps 10 guests across five en-suite cabins with a crew of three to take care of all guests on board. Steps lead up both hulls to the main deck cockpit, where there is a shaded aft sofa, port L-shaped alfresco dining area and a sofa/sunbed to starboard with a staircase connecting to the flybridge. Above, the flybridge provides a shaded place for alfresco dining and lounging, placing a forward helm station on each side with a C-shaped sofa and drinks table behind to port and a sunbed opposite. There is a foredeck cockpit lined with seating where family and friends can relax and take in the views and two forward trampolines for comfortable sunbathing and entertainment. The accommodation is placed in each hull to leave the central section free for the forward helm station, galley and living area. To starboard, there is an L-shaped sofa and a raised table which can be extended outwards for meal times, and the opposite asymmetrical setting is formed with a coffee table. Twin Volvo D3 engines with shaft drive, producing 110 HP with soundproofing will transport guests even in light wind conditions. The accommodation sleeps a maximum of 10 guests over 5 en-suite cabins: 1 Master suite, 3 double cabins and 1 twin cabin. ~ The master suite is placed forward to starboard and the large room provides a forward day bed, a corner desk and an aft bathroom containing two sinks, a shower and an enclosed toilet as well as two large wardrobes. ~ The double cabins are located aft of the main salon and forward and amidships to port, with the twin cabin to the aft. All cabins have a wardrobe, toilet, sink and shower. ~ The crew accommodation is situated in the bow of each hull and sleeps 3. We do have available further amenity, owner and price information for the 22.15m (72' 8") yacht BLACK CAT, so please enquire for more information. 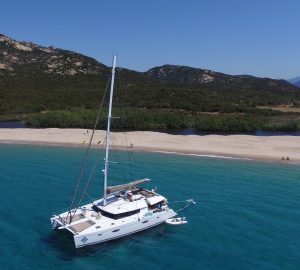 "Fountaine Pajot’s range of sailing catamarans has been designed with remarkable living space and superb levels of comfort and performance so you can share all the pleasures of a premium cruising lifestyle."